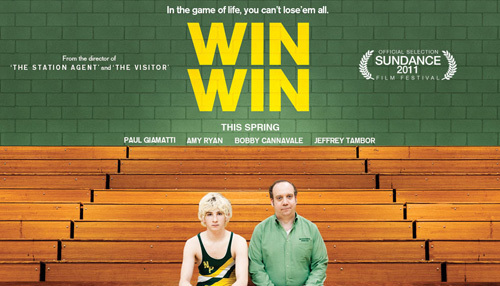 Win Win is a likeable film which takes unlikely paths to get to an unexpected conclusion. It has flawed characters, but somehow we are able to appreciate them despite their mistakes. At the center of the film is a father and husband who feels he is failing his family when his business doesn’t make enough money to support them. 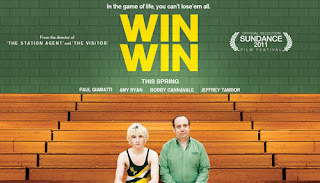 Timely and touching, Win Win is a winning independent comedy from Oscar nominated filmmaker Tom McCarthy (for a co-writing credit on the screenplay for Pixar’s Up). The story follows the repercussions of one bad decision made by Mike Flaherty (Paul Giamatti), a struggling lawyer whose practice is threatening to go under. Deciding to be a caretaker for one of his aging clients simply to collect a large payment each month, Mike turns around and puts his client in a nursing home. This decision comes back to haunt him when the grandson (Alex Shaffer) comes to visit. It turns out the boy is also a champion wrestler, and since Mike also coaches a high school wrestling team, this seems to be kismet. Soon the wrestling team is winning matches for the first time and Mike feels more competent raising his family. This is all threatened when the boy’s mother (Melanie Lynskey) suddenly arrives, and the truth about Mike’s deception comes out. It is a film about winning, but there are no guarantees that anyone will win what they want within this film.